Larger stones are sold individually as specimens. The letters that I use (A B C …) are just my own system for telling them apart and have nothing to do with their rating. I also normally show a number of stones for each size just to show how different and unique each one can be. I use a penny in the images to help give an idea of that particular size. The price, however, is for one individual stone and not the number shown in the image. Each product page will also give the approximate dimensions for each size and the exact dimensions for any specimens. Unless otherwise noted, all stones and crystals are A grade or better. The only stones that I sell in a B grade form (and they are so marked) are fluorite and blue lace agate. I do this in order to offer a low cost version of only these 2 stones in addition to the regular A grade. As every stone and crystal comes from the earth, each one is unique with its own personal quality and rate of vibration - just like each of us :) Color and clarity will also vary. However, I do my best to provide you with the highest quality at the best price. *In the case of several larger raw crystals such as quartz, amethyst or citrine points the range in grams for each size will not be exactly the same as those noted above. 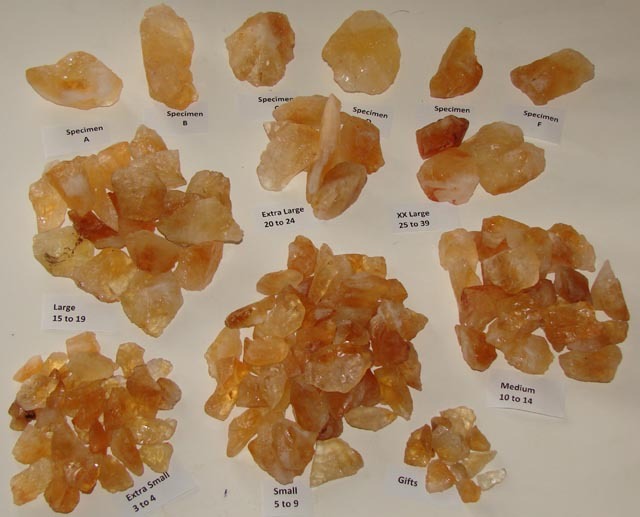 Here's a good example of 4 pounds of rough citrine sorted into sizes and specimens.